Frank P. Zeidler was the last Socialist to run a major American city. He served three terms as mayor of Milwaukee (1948 to 1960). During his tenure the city purchased its first garbage trucks, built new fire stations, rebuilt and repaved roads, and constructed low-income and veterans housing. When he left office in 1960, Milwaukee's economy was booming and the city had grown to become the 12th largest in the nation. Zeidler was born in Milwaukee on September 20, 1912. He enrolled for college at both the University of Chicago and Marquette University but ill health prevented him from earning a degree. He joined the socialist party due to its emphasis on peace and improving conditions for workers. Zeidler became a part of the party's stronghold in Milwaukee, which controlled the mayor's office for nearly half a century, ending with Zeidler. Zeidler was first elected to office in 1938, running as a Progressive for county surveyor. He won a six-year term to the Milwaukee School Board in 1941 and again in 1947. In 1948 Zeidler became Milwaukee's third Socialist mayor after Emil Seidel and Daniel Hoan. When Zeidler took office, Milwaukee was in desperate need of structural and social improvements. Hobbled by the Great Depression of the 1930s and World War II in the 1940s, the city had spent little to update existing services to meet the needs of a growing population. Under Zeidler, public housing was built, the first educational television station was established in Wisconsin, slums were cleared and city beautification programs enacted. He also made strong statements for civil rights. Only 47 when he stepped down, Zeidler remained active, working as a teacher, labor arbitrator and mediator, and consultant. He served as director of the Department of Resource Development under Governor John Reynolds from 1963 to 1964, and in 1976 he ran for U.S. president on the Socialist Party ticket. His 1,022-page memoir, “A Liberal in City Government”, written in 1962, was finally published in 2005. 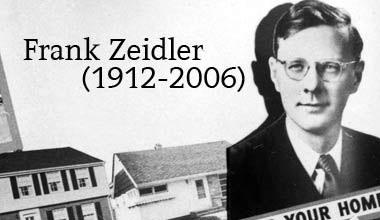 Zeidler died of congestive heart failure in Milwaukee in 2006. His wife and six children survived him.